A woman enjoys the quietness and scenery while traveling in a canoe along a river between Whitefish Lake and Rock Lake in Algonquin Provincial Park in Ontario, Canada. The reflections of the tops of the forest trees decorate the surface of a river located between Whitefish Lake and Rock Lake in Algonquin Provincial Park in Ontario, Canada. A woman in a canoe paddles slowly through this scenic paradise where the water ripples from the oars and disperses alongside the canoe. As the sun disappears at sunset, the tranquility around the river becomes uncanny as this woman scours the banks for any signs of wildlife. The inside of the canoe is nearly empty except for a backpack and a rope making it easy for this woman to glide across the surface of the river amongst the beauty of Algonquin Provincial Park. At one end of the river is Whitefish Lake, another beautiful place to canoe which covers an area of about 12.6 kilometers. The other end is home to Rock Lake, also a popular place for canoeists. Picture of a woman in a canoe along a river at sunset in Algonquin Provincial Park in Ontario, Canada. There are campgrounds located throughout the park where many stay allowing them easy access to the water where they canoe amongst the scenery, the only way to explore the interior of Algonquin Provincial Park in Ontario, Canada. Approximately 2,000 kilometers of canoe routes are in the interior of the park, some suitable for beginners with others being fairly challenging for the experienced canoeists. 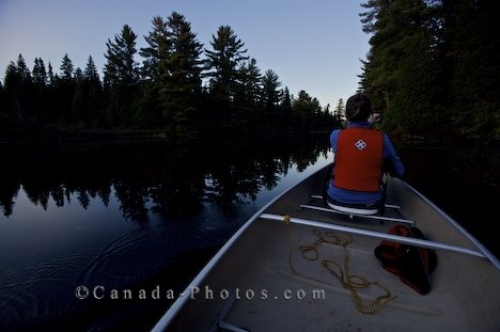 Paddling a canoe along a river between Whitefish Lake and Rock Lake in Algonquin Provincial Park, Ontario, Canada. Model Released.